Grapes are a a common type of berry fruit that have been included in cooking and wine for centuries. The distinctive nutrient profile of grapes includes high levels of phytochemicals and phenolic compounds that provide well-documented antioxident effects to support cardiovascular health, but the digestive impact of grapes is less established. Current research supports the notion that, while grapes aid healthy digestion for people suffering from certain bowel disorders, the nutritional profile of grapes may also aggravate certain digestive conditions. The fiber content of grapes is largely composed of insoluble fiber. Insoluble fiber remains intact as it moves through your intestines, supporting the formation of bulk that produces healthy stools. If you suffer from regular or occasional constipation or bowel impaction, increasing your intake of natural insoluble fiber can ease digestive discomfort and help you produce more regular bowel movements. The clinical center of the National Institutes of Health recommends increasing your daily intake of grapes as a healthy option for increasing your insoluble fiber intake to support digestive regularity due to the high fiber content and relatively low content of undesirable nutrients like fat or cholesterol. Diarrhea and loose stools result when your body fails to properly absorb nutrients and water from your food, causing them to pass quickly through your digestive tract without properly forming. One of the primary health concerns of loose stools is replacement of your body's lost water content. Grapes have a high water content; approximately 70 percent of the weight of grapes comes from water. Ingesting grapes is one food option for replacing the water lost through loose stools. However, the National Institutes of Health does not recommend grapes in an anti-diarrhea diet because of their high insoluble fiber content. Soluble fiber, found in oats and some peeled fruits, absorbs water in your intestines, reducing the likelihood that you'll experience loose or "watery" stools. Grapes are low in soluble fiber and therefore do not possess the same absorptive capacity. Even people without bowel disorders may experience digestive discomfort like gas and bloating after eating grapes. One explanation for the tendency to be gassy caused by grapes is the insoluble fiber content. The American College of Gastroenterology suggests that anyone experiencing chronic gas, bloating and constipation eliminate or reduce her daily intake of hard-to-digest fruits and vegetables, including grapes. 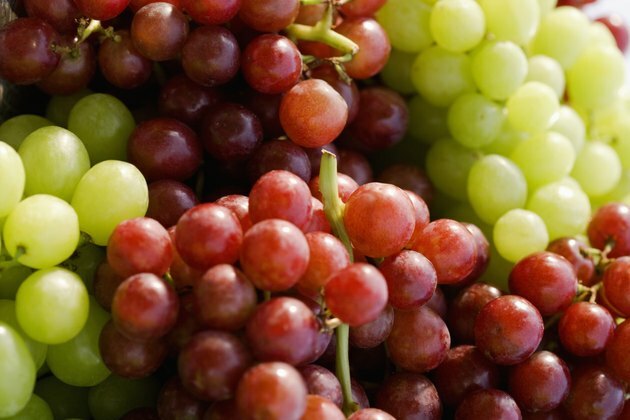 Another cause of grape-related stomach discomfort is fructose intolerance. A significant portion of the calories in grapes comes from the natural fruit sugar fructose. Some people cannot properly absorb or digest fructose, resulting in a buildup of gas throughout the stomach and intestines. Limiting your intake of grapes and other high-fructose foods like fruits and sweets should reduce the bloating effects of a fructose intolerance. Ongoing research exploring the antimicrobial effects of grapes suggests that grapes may be used in the treatment of bacteria-based food-borne illnesses that impact the digestive system. A 2010 study published in the "International Journal of Molecular Science" reviewed the potential of grapes and grape extracts to inhibit the growth of certain microbes related to food-borne illnesses. Researchers found that the phenolic compound extracts from different parts of the grape exhibited inhibitory effects on a variety of disease-causing microbes including salmonella and E. coli. Though researchers have demonstrated the potential of grape extracts to inhibit bacteria growth, ongoing studies are required to determine the most effective way to harness these properties and utilize them to treat infections after they've been introduced into the digestive tract. American College of Gastroenterology; Belching, Bloating and Flatulence; Larry Szarka, M.D. et al. Will Raisins or Grapes Cause High Blood Sugar? What Are the Health Benefits of Peaches?